A native of Ontario, Canada, Robert Douglass Montgomery was born in 1907 and as a boy, moved to Pasadena, Calif., where at 14 he became involved in the famous Pasadena Playhouse — while still in high school, he was named assistant director. He quit high school to go to New York where he won a role on Broadway when he was only 17. He went on to perform as a teenager in a half dozen New York shows. While visiting his family in California in 1930, he was signed by MGM which loaned him out to other studies and which changed his name to Kent Douglas because another Montgomery — Robert — was already a well-known actor. 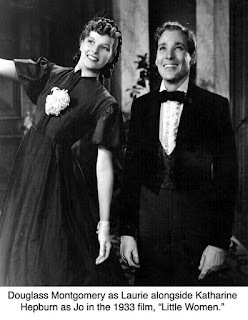 He earned second-lead roles in such films as “Paid,” in 1930, with Joan Crawford, and “Little Women,” in 1933, in which he played Laurie, the sweet young man rejected by Jo, played by Katharine Hepburn. In all, he appeared — and often starred — in 17 films in the 1930s. When he returned to doing some Broadway shows in the mid-1930s, he changed his name back to Douglass Montgomery, and used that name for the rest of his career. 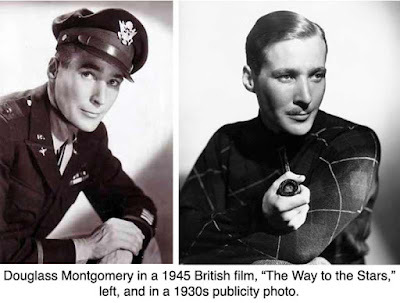 Montgomery gained some unusual notoriety in 1934 when he was a victim of what was then styled as a madman’s attempt to kill Hollywood actors. According to a contemporary account, “He was rehearsing a stage play at the Pasadena Community Theatre. Night after night, he parked his car in a dark and obscure corner of a lot adjoining the theatre. And he drove to his mother’s home in Altadena each night after rehearsal. “One night, he was leaving the theatre when Universal Studios called him on the phone and asked if he could come right over to make a retake. He dashed out, climbed in his car and started for Hollywood, instead of up the hilly and winding mountain road to Altadena, where the slightest mishap would send his car careening over steep embankments to the rocks far below. “And as he sped along the wide, smooth highway toward Universal City, one of the front wheels of the car came off and the car veered crazily, tilted to one side, crashed to the ground. The wheel rolled swiftly through the darkness and struck a nearby house. People came running to the scene. Then it was discovered that some fiend had taken off the hub caps of all four wheels, had removed the nuts that hold on the wheels, and had slipped the caps back on the wheels so that no one would notice what had been done — until too late. The incident gained even wider exposure after, a few nights later, actor Jack La Rue was sleeping in his home when a four-by-four log came crashing through a bedroom window, landing only a few inches from his head. “Police are seeking for a madman who, they think is trying to avenge some imaginary wrong; or perhaps a man who has failed in pictures and is trying to gain satisfaction by maiming or killing men who have risen to prominence that he never can reach.,” the account said. No one was ever arrested, however. While in England, he met Kathleen Tamor Young, an actress and costume designer; she was married at the time to Michael Wilding; they divorced in 1951 and he married Elizabeth Taylor. Kay Young had appeared in several English movies including “In Which We Serve” in 1942. She and Montgomery became close friends. He returned to the United States in 1945, appeared in several early television shows, but perhaps drawn by Young, returned to England where he made several movies and appeared in plays. The Montgomerys lived in California for a while, but in 1958 moved to New York where he appeared on Broadway, but soon decided to retire. He lived several years in Darien and in January 1966, probably aware of his illness, he, his wife and his longtime friend, Thomas Wanamaker, moved to Fairfields, the Georgian-style brick mansion on Golf Lane built in 1903. There, Montgomery continued his interest in raising Irish wolfhounds. But in July that year, he was taken to Norwalk Hospital where he died of spinal cancer. He was only 58. Kay Young then married Australian-born actor Miles Eason. The Easons lived at first at Fairfields and later in a home on Olmstead Lane. Kay Young Montgomery Eason died here in 1994 at the age of 78. Dear Jack Sanders: Greatly appreciate your most complete, detailed, authentic account on the life of actor Douglass Montgomery. My fascination with his artistic life can be gleaned somewhat by the following: "Dear Animat Oldies, In praise of your discerning cover photo image of this movie and for uploading a quality "Douglass Montgomery - Harmony Lane - 1935" for us to appreciate -- you are the third channel I've encountered to have posted this GEM of a movie. Rendered with such poignancy and refined aesthetic sensibilities, I've shed copious tears after each viewing… having been singing (for myself) Stephen Foster songs, ever since my school days in South Korea. I've just made up a playlist of Douglass Montgomery (Stephen Foster, as well) -- seems to exist a pent-up yearning to view his artistic endeavors; hope to find more postings of his works, should there be any generous offerings risking copyrights even for a brief period of days (“Life Begins with Love,” 1937 has already been deleted after 3 days of being included on my playlist – glad to have imprinted in my memory by viewing a couple of times, lest perchance). THANK YOU for posting this film. ~KIM Y April 18, 2019"
Thank you, Kim Y. Good luck in your pursuit!